SNAP IMPRESSION: Do you believe in miracles? What a game – and especially what a game to watch during our Sally Kabel fundraiser. Mario Williams had an incredible statistical day, despite one horribly stupid penalty that could have cost us the game. CJ and Freddie (as a receiver!) were strong, and Kiko Alonso is lots of fun to watch. And then, of course, there’s EJ – leading the first of what I hope will be several comebacks (although it’d be nice to win a no-doubter every so often). Even when we had only six points, I thought he was playing well. And, speaking of six points – Carpenter kicks a 55-yarder and an ugly 48-yarder after missing a 42-yarder? I’ll take it. Between the fundraiser and the game, I think this was my favorite McFadden’s moment ever. Unlike the Pats victory, no cops were involved. Meet Dan Farr – A resident of Stanford who works in Greenwich, in finance. But, despite where he lives and works, this is no Giants or New England fan. He’s a proud UB grad, and grew up in Elmira, NY, in a family of Bills fans (being a Bills fan was “a family thing,” he says.) He proved his Bills cred by working at a Ralph concession stand during his UB years – giving him a chance to see the games even when he didn’t hold a ticket. He’s been coming to McFadden’s for several years, and this week believes he saw EJ Manual “become a man” with the comeback he led. 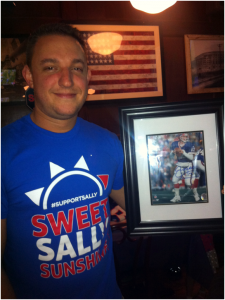 Beyond being a Bills fan, Dan’s lucky (not to mention generous) – which is why he’s holding the grand prize from our Sally Kabel fundraiser: a signed Jim Kelly photo donated by Hunter’s Hope. Dan had never met Matt Kabel before, but has followed him on Twitter for two years, and also follows the Kabel family’s blog about their journey with Sally, http://www.sweetsallysunshine.com/. A big thank you to everyone who contributed to the fundraiser. I know the Kabel family appreciates it beyond what they can express.